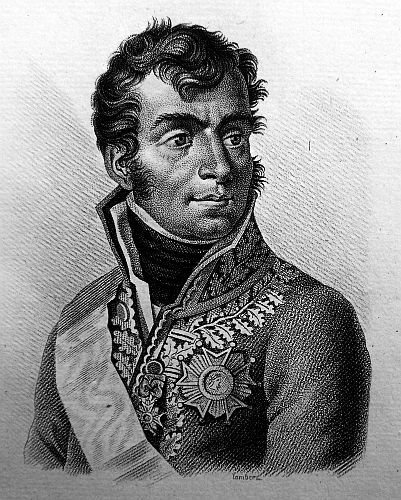 The French would engage the Russians under General Kutuzov but they would first have to catch them. Kutuzov was in command of 32,000 Russian troops and 18,000 Austrians. However, the Russians were in no condition to make a stand so they fell back towards Vienna. The French were slowed in their pursuit by destroyed bridges and bad weather. Lannes was now at Braunau and was ordered to march after the Russians, but after weeks of campaigning his health had deteriorated. Lannes turned over the 5th Corps to Oudinot, but still managed to keep up, although not with the advanced guard. 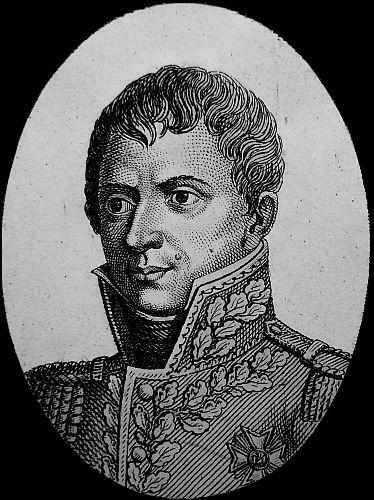 Napoleon put Murat in command of all military manners because he was busy on the diplomatic level. If the neutral Prussians joined the Russians, the overstretched French would be in a dire situation. On the 7th of November, Lannes and Murat reached Melk, where they remained for a couple of days due to Murat’s lack of initiative. However, Lannes got some much needed rest and regained some strength during this short break. The Russians abandoned the Austrian capitol of Vienna and crossed the Danube. General Kutuzov planned to join with the Russian General Buxhowden, who was marching with Russian reinforcements. The French entered Vienna with its bridges still intact over the Danube, but these bridges were mined and guarded by the Austrians. The capture of the Tabor bridge by Bertrand, Lannes, and Murat would be a highlight of the campaign. They approached the bridge and ordered the Austrians to hold their fire on behalf of a recently signed armistice. 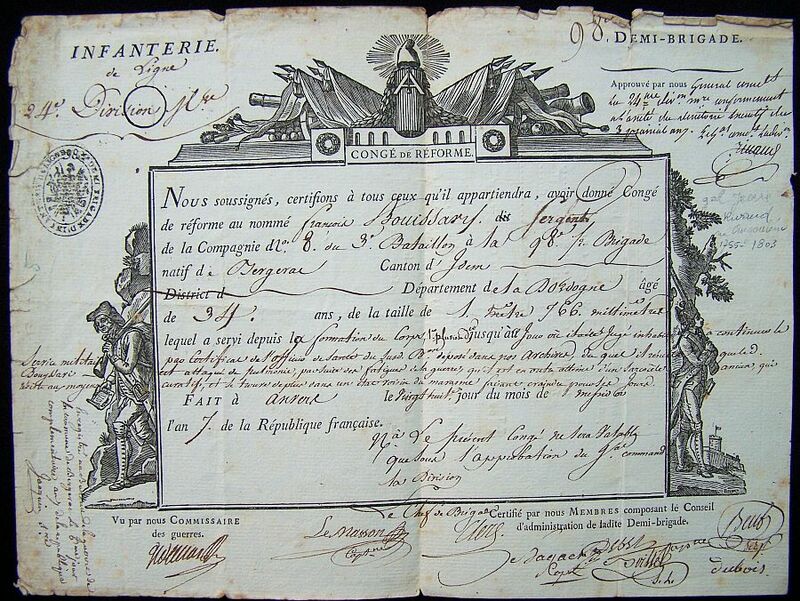 The scam worked and the bridge was taken by Oudinot and his grenadiers. The French would cross the Danube with Lannes and Oudinot leading the way. On the 15th of November, Lannes reached Hollabrunn. The Russian General Kutuzov was still trying to find and assemble with General Buxhowden. In order to slow the French advance Kutuzov ordered Bagration to move on Schongrabern and make a stand. 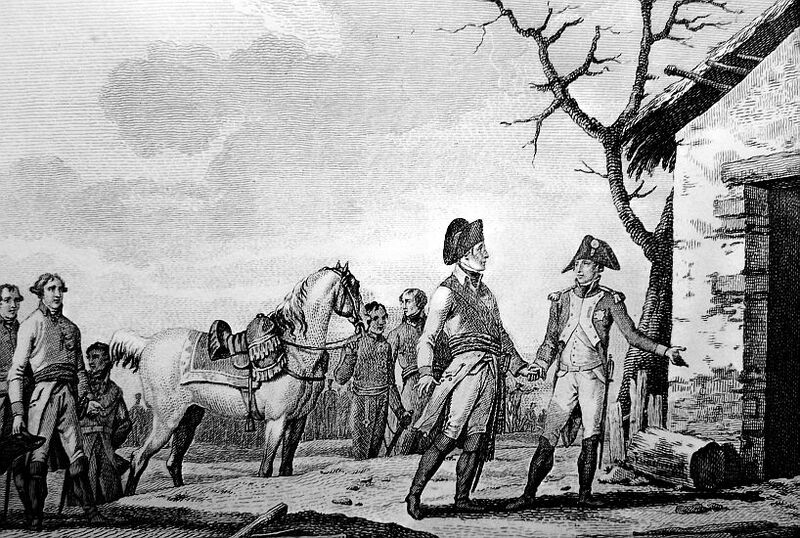 When Bagration reached his destination he found it already occupied by Lannes and Murat. On the 16th of November, the French with its superior numbers defeated the Russians, but at a heavy cost. 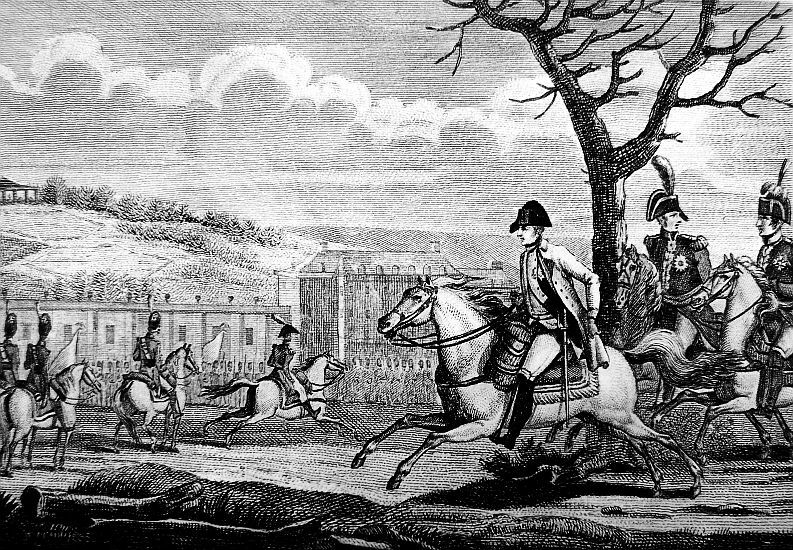 During the battle Oudinot was wounded and had to be taken to a hospital in Vienna. 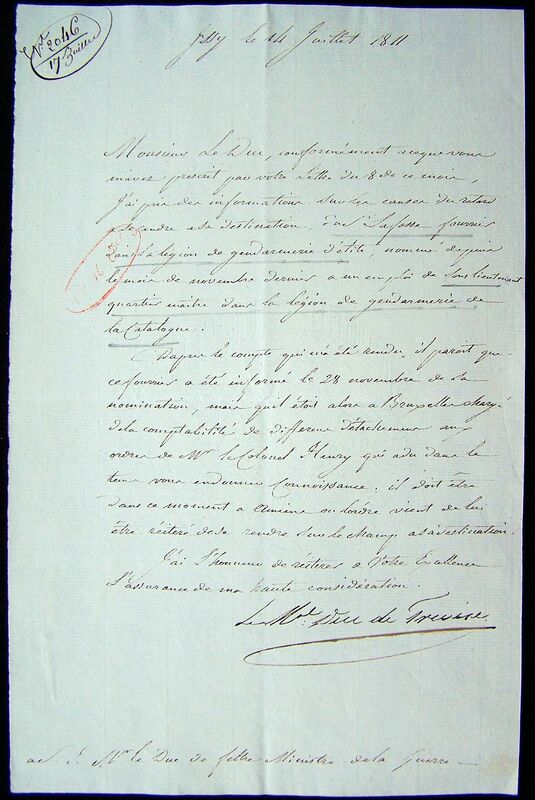 Lannes was on the move again and he reached Brunn on the 21st of November. The outstretched French at this point would have to pause and regroup. 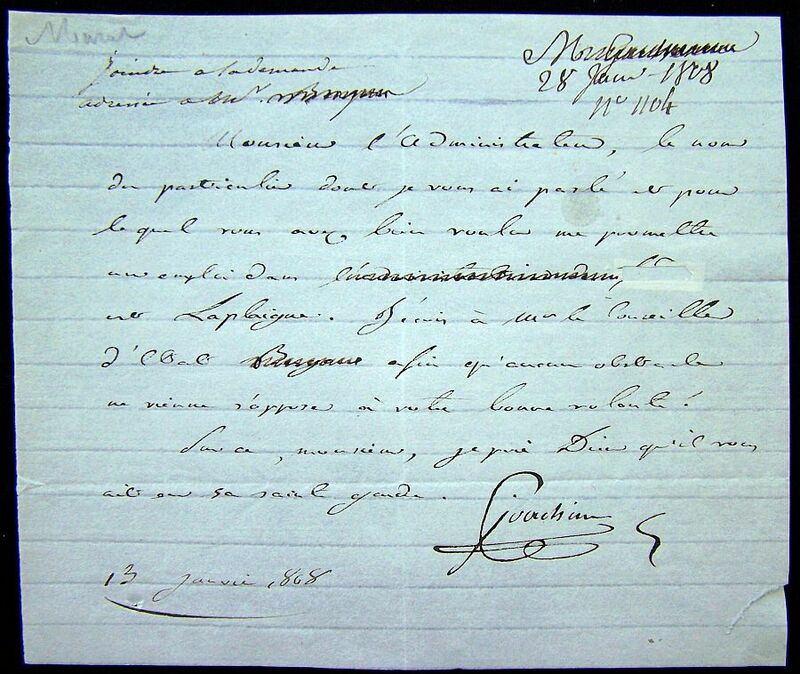 During this pause Suchet joined Lannes on the 27th of November. On the eve of the battle of Austerlitz, Lannes was ordered to hold the Brunn-Olmutz road, and make a stand against Bagration’s 17,000 troops. 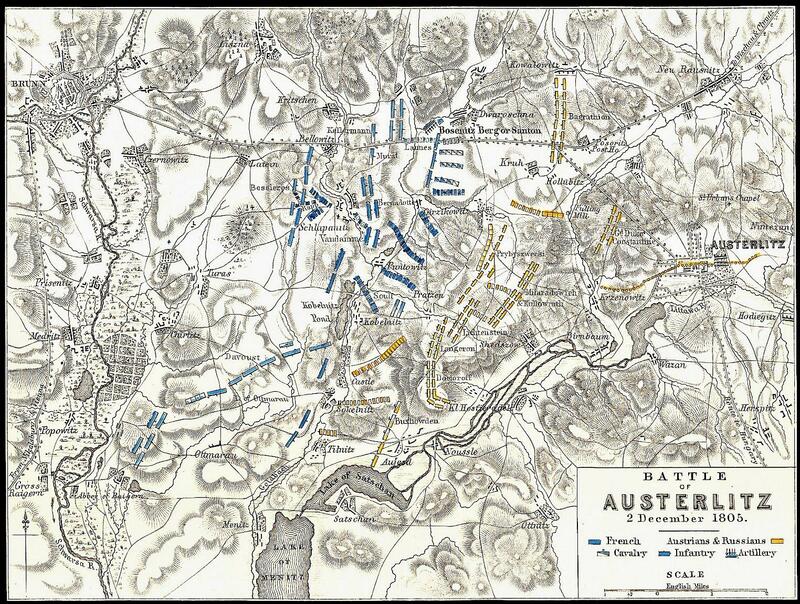 On the 2nd of December, the battle of Austerlitz began. 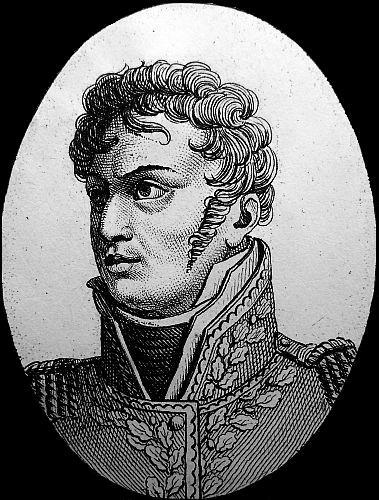 During the morning hours, Lannes would hold his ground against the Russians, and by afternoon he went on the offensive. At three o’clock in the afternoon Bagration retreated, but the French were exhausted and only pursued the Russians for a short distance. 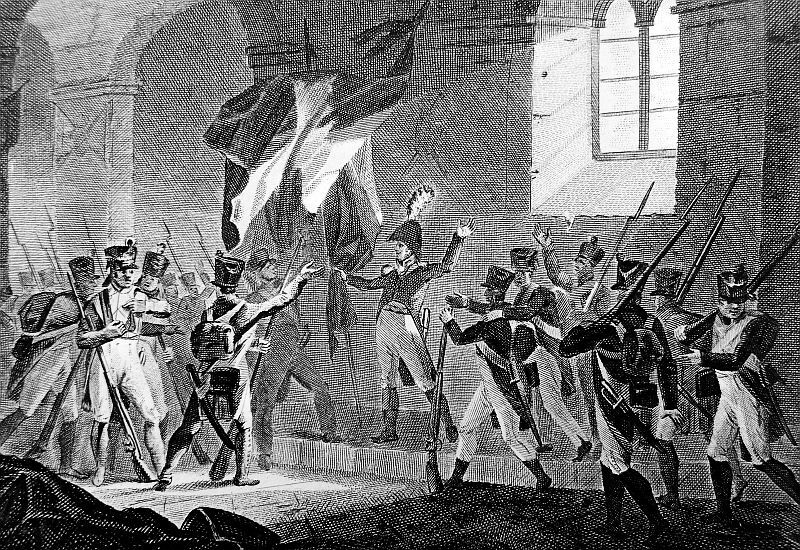 The French victory at Austerlitz brought an end to the Third Coalition. The role that Lannes played in during this battle was crucial, and he thought that he and the 5th Corps received little praise in the thirtieth bulletin. He was tired, sick, hungry and mad, so he left his command without permission. 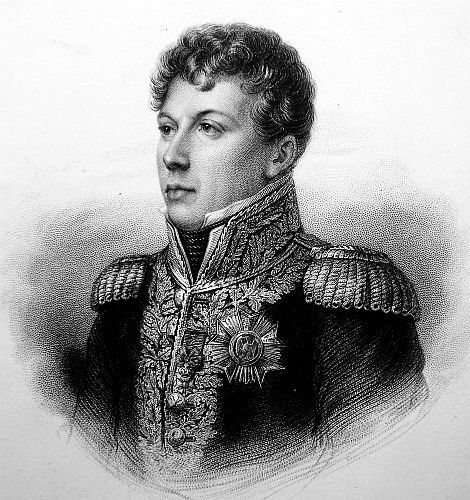 Mortier would take command of the 5th Corps while the irrate Lannes rode for France. The army under Marshal BERNADOTTE advanced from Munich on the 26th, and arrived the next day at Wasserburgh, on the Inn, and proceeded to Altenmarkt, where it halted that night. Six arches of the bridge had been burnt down. Count MANUCCI, Colonel of the Bavarian army, advanced from the Roth to Rosenheim. He also found the bridge burnt, and the enemy on the other side. After a brisk cannonade, the enemy retired from the right bank; several battalions of French and Bavarians passed the Inn, and on the 28th, at noon, both the bridges were completely repaired. Colonels MORIO and SOMPS, of the Engineers, were indefatigable in their exertions to reestablish the bridges. The enemy were hotly pursued as soon as the troops could pass over; fifty of their rear-guard were taken prisoners. Marshal DAVOUST, with the army under his command, set out from Freysing on the 26th, and reached Muhldorf on the 27th. The enemy defended the right bank of the river, where they had some batteries advantageously placed. The bridge had been so much destroyed, that it was with difficulty repaired. On the 28th, at noon, a considerable part of Marshal DAVOUST’S division had passed over. Prince MURAT ordered a brigade of cavalry to pass over the bridge of Muhldorf, caused the bridges of Oeting and Marekhl to be repaired, and crossed them with a part of his reserve. The EMPEROR himself went to Haag. The division of Marshal SOULT lay on their arms beyond Haag; the corps under the command of General MARMONT is to halt this night at Wihsbiburgh; that of Marshal NEY at Landsberg; Marshal LANNES’S on the road from Landshut to Braunau. From all the information which has been received, it appears that the Russian army is retreating. There has been a great deal of rain during the day. All this country between the Iser and the Inn is nothing but a continued forest of fir trees; the soil is excessively barren. The army has much reason to be satisfied with the zeal and attention of the inhabitants of Munich, in supplying them with such articles of provisions as they required. Marshal BERNADOTTE arrived at ten o’clock this morning at Saltzbourg. The ELECTOR had quitted it several days before. A corps of 6000 men, which was placed there, had precipitately retired on the preceding evening. The Imperial Head-quarters were on the 28th ult. at Haag; on the 29th at Muhldorff; and this day at Braunau. 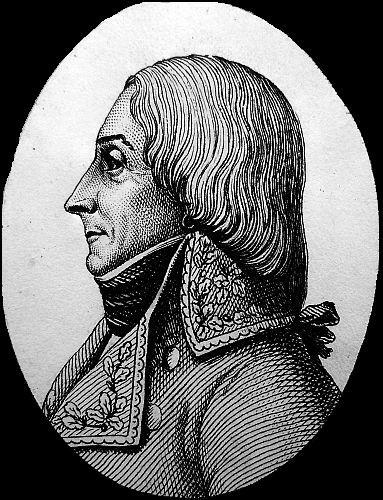 Marshal DAVOUST employed the whole of yesterday in repairing the bridge of Muhldorff. The first regiment of chasseurs made a fine charge against the enemy, killed 20 men, and took several prisoners, among whom was a Captain of Hussars. 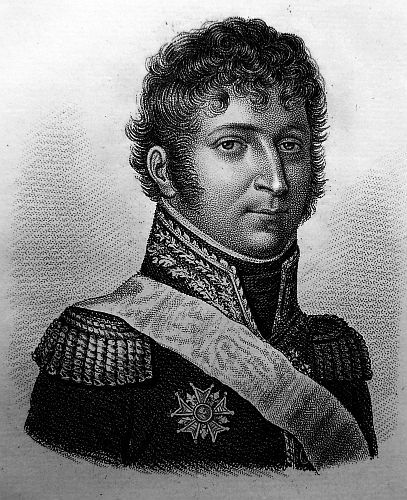 Marshal LANNES arrived yesterday with the cavalry, at the bridge of Braunau. He had set out from Landshut. The bridge was cut away. He immediately embarked 60 men in two boats. The enemy, who were pursued by the reserve under Prince MURAT in other directions, abandoned the city. The boldness of the chasseurs of the 13th, contributed to hasten the enemy’s retreat. This misunderstanding between the Russians an Austrians, begins to shew itself. The Russians plunder every where. The best informed Officers among them are perfectly aware that the war which they wage is impolitic, since they have nothing to gain against the French, whom nature has not placed in a situation to be their enemies. Braunau, as we find, may be considered one of the finest and most useful acquisitions of the army. This place is surrounded with a circumvolation, fortified with bastions, draw-bridges, a half-moon, and ditches full of water. There are numerous magazines of artillery, all in good condition; but what will with difficulty be believed is, that it is completely supplied with provisions. We found there 40,000 rations of bread, ready to be distributed, and more than 1000 sacks of flour. The artillery of the place consist in 45 pieces of cannon, with change of carriages, mortars provided with more than 40,000 cannon shot, and some howitzers. The Russians left behind them about a thousand weight of powder, great quantities of cartridges, lead, a thousand muskets, and all the ammunition necessary to support a long siege. The EMPEROR has appointed General LAURISTON, arrived from Cadiz, Governor of the place, and the head-quarters were established there. Prince MURAT continued his march pursuing the enemy sword in hand. He arrived on the 31st at Lambach. 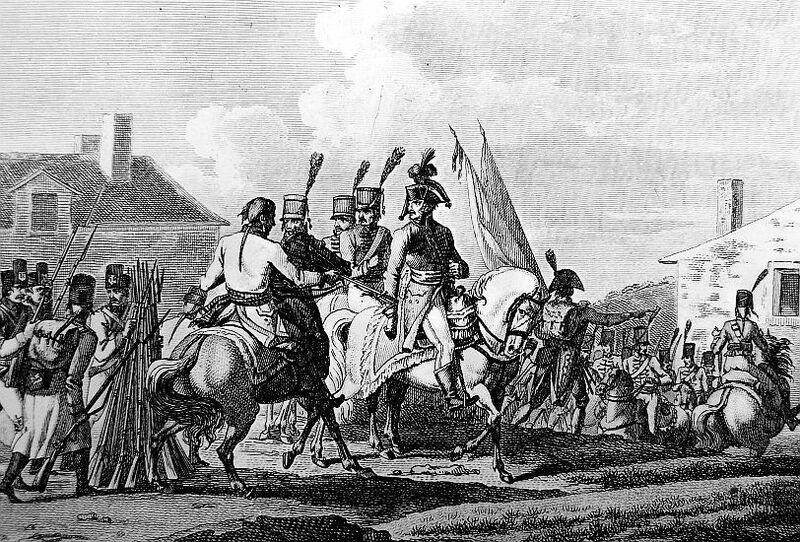 Eight Russian battalions advanced to cover the retreat of the Austrians, but, on being charged by our troops, they retreated in disorder to Lambach. Five hundred prisoners were taken, amongst whom are one hundred Russians. General WALTS, with his Division of Cavalry, has taken possession of Wels. Two divisions have taken position at Lambach. A part of the division of Marshal DAVOUST has passed the Fraun. Another division is before Lambach, and the rest of his corps is on the heights of Lambach. Marshal SOULT arrived this evening at Wels, and Marshal LANNES at Lintz. General MARMONT is marching to turn the position on the Ems. The fort of Passling, in the defile of Collinghar, has been taken, and 500 prisoners. Marshal DAVOUST’S advanced posts are near Steyer. A division under Prince MURAT entered Lintz the 1st. 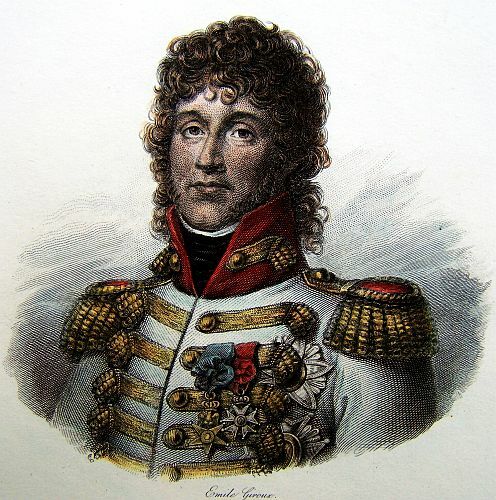 Marshal LANNES arrived there on the 3rd. Since the passage of the Inn we have made from 1,500 to 1,800 prisoners. The EMPEROR has established his head quarters at Lambach. At the battle of Diernstein, where four thousand French, who were attacked on the 11th by twenty five or thirty thousand Russians, maintained their position, killed from three to four thousand of the enemy, took some colours, and made one thousand three hundred prisoners, the 4th and 9th regiments of light infantry, and the 100th and 32d regiments of light infantry of the line, covered themselves with glory. General GAZAN, on this occasion, displayed a great share of bravery and conduct. The Russians , the day after the battle, evacuated Krems, and quitted the Danube, leaving one thousand five hundred prisoners in a state of the greatest want. We found in their field hospitals, a great many wounded, who died in the night. It appeared to have been the intentions of the Russians to wait for reinforcements at Krems, and maintain their position on the Danube. The battle of Diernstein disconcerted their plan. They could perceive, from what four thousand French had done, what they were to expect from equal force. 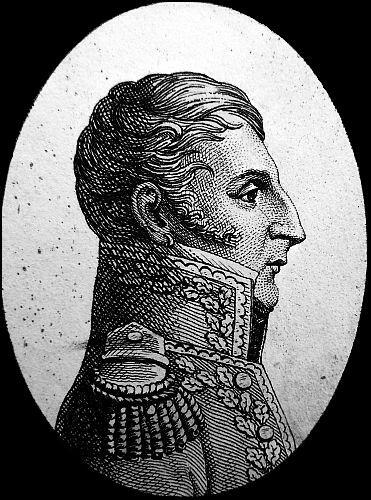 Marshal MORTIER set out in pursuit of them, while other divisions of the army passed the Danube, by the bridge of Vienna, to outflank them on the right; and the corps of Marshal BERNADOTTE marches to turn their left wing. Yesterday, the 13th, at ten in the morning, Prince MURAT passed through Vienna. 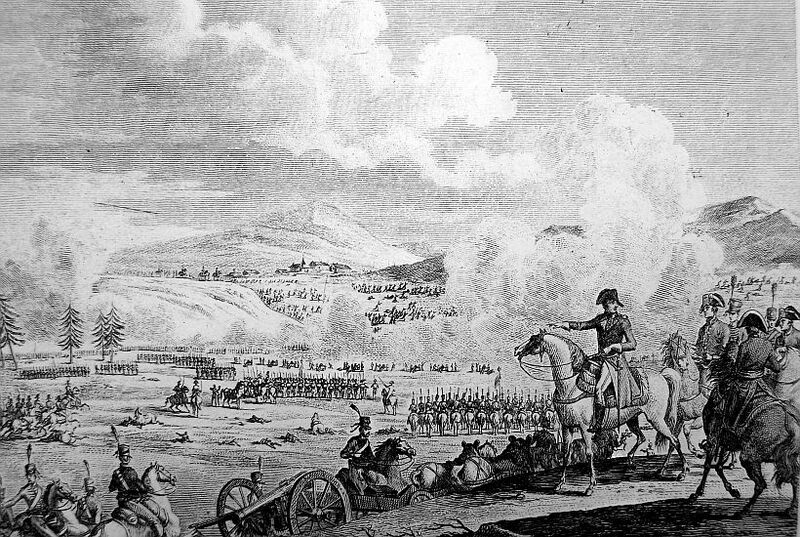 At the break of day, a column of cavalry advanced to the bridge over the Danube, which it passed, after some conferences with the Austrian Generals. The enemy’s engineers, who were ordered to burn the bridge, attempted it often, but could not succeed. 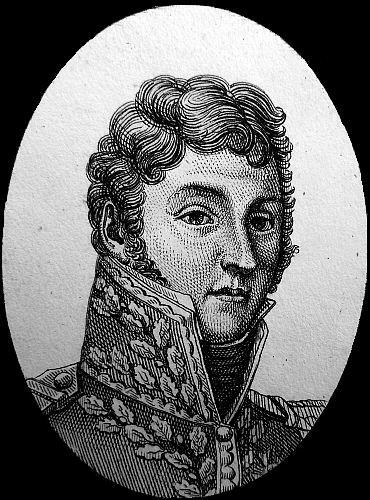 Marshal LANNES and General BERTRAND, Aides-de-Camp to the EMPEROR, were the first who passed over the bridge. The troops did not stop at Vienna, but pursued their march to follow their direction. Prince MURAT established his head quarters in the house of Duke ALBERT. Duke ALBERT has been a great benefactor to the city. In many parts of it they wanted water; he ordered it to be conveyed there at his own expense, and spent very large sums for that purpose. Annexed is an account of the artillery and stores taken at Vienna. The House of Austria has no other foundry, no other arsenal, than those at Vienna. The Austrians had no time to carry of above a fifth, or a fourth of their artillery, or the materials for casting it. We have enough ammunition to last for four campaigns, and to renew four trains of artillery four times over, if we should lose them. We have also found enough heavy artillery to supply a great number of fortresses. The EMPEROR has taken up his residence in the palace of Schonbrunn. He went to Vienna this day at two o’clock. He passed the rest of the night, in visiting the advanced posts upon the left bank of the Danube, as well as the positions, and in satisfying himself, personally, that the duty was properly done. He returned to Schonbrunn at break of day. The weather is become uncommonly fine. The day, though cold, is one of the finest since the commencement of winter. Trade, and everything else, goes on at Vienna as usual; the inhabitants are full of confidence, and quite easy. The population of the town amounts to two hundred and fifty thousand souls. It is not supposed, that ten thousand people have left it on account of the absence of the Court and the persons of distinction. The EMPEROR received, at noon, M. de WABNA, who is at the head of the administration of all Vienna. The corps of Marshal SOULT passed through Vienna, at nine o’clock this morning. The division of Marshal DAVOUST is defiling through it at this moment. General MARMONT gained several advantages in actions of advanced posts at Lioben. The Russian army is daily receiving reinforcements. The EMPEROR has made some more presents to the ELECTOR. He has given him fifteen thousand musquets, taken in the arsenal of Vienna, and has ordered all the artillery to be restored to him which Austria had taken in the Bavarian States on the former occasions. The town of Kuffstein has surrendered to Colonel POMPEI. General MILHAUD followed the enemy on the road to Brunn, as far as Volkersdorff. This day, at noon, he took six thousand prisoners, and a park of forty pieces of artillery, ready harnessed. 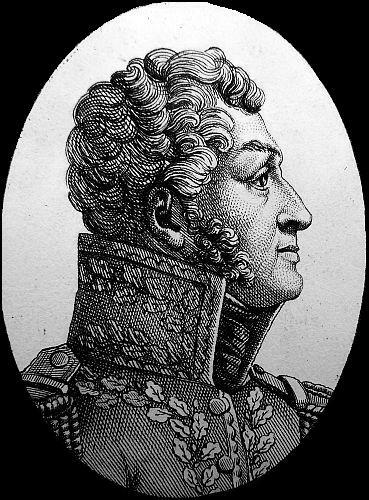 Marshal LANNES arrived, at two o’clock in the forenoon, at Stokereau. He found there an immense quantity of clothing, eight thousand pair of shoes and half boots, and cloth enough to make great coats for the whole of the army. Several boats, which were dropping down the Danube, freighted with artillery, leather, and articles of clothing, have been stopped. The EMPEROR expresses his satisfaction to the 4th regiment of light infantry, to the 100th of the line, to the 9th light infantry, to the 32d of the line, for the bravery which they displayed at the battle of Diernstein, where their firmness, in preserving the position which they occupied compelled the enemy to abandon theirs on the Danube. His MAJESTY expresses his satisfaction to the 17th and 30th regiments of the line, which, at the battle of Lambach, made head against the rear guard of the Russians, defeated them, and took 400 prisoners. His MAJESTY also expresses his satisfaction to OUDINOT’S grenadiers, which, at the battle of Amsletten, drove the Austrians and Russians from their excellent and formidable positions, and took 1500 prisoners, of whom 600 were Russians. His MAJESTY is satisfied with the 1st, 16th, and 22d regiment Chasseurs, with the 9th and 10th regiments of Hussars, for their good conduct in all the charges which they have made from the Inn to the gates of Vienna, and for the eight hundred Russians taken prisoners at Stein. Prince MURAT, Marshal LANNES, the reserve, and all the cavalry, entered Vienna the 13th, took possession of the bridge over the Danube the same day, prevented it from being burned, passed it immediately, and set out in pursuit of the Russian army. We found in Vienna more than two thousand pieces of cannon, an arsenal containing one hundred thousand muskets, ammunition of all kinds; in fact, everything to complete three or four armies for a campaign. The inhabitants of Vienna appear to view the army with sentiments of friendship. 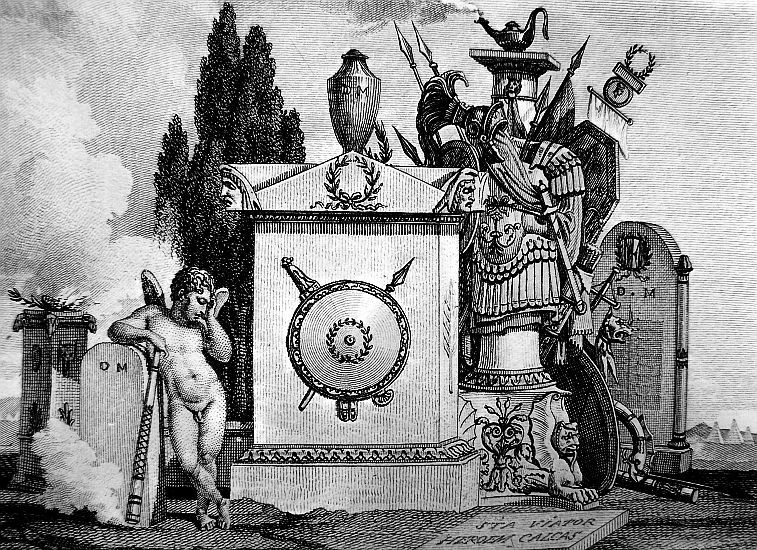 The EMPEROR has given orders that the greatest respect should be paid to property, and that the greatest attention should be shewn for the inhabitants of this capital, who see with pain the injustice of the war, and who evince to us, by their conduct, as much friendship as they shew hatred to the Russians, a people who, by their habits and barbarous manners, should inspire all polished nations with the same sentiments. pleased with Murat, Lannes, Davout, Soult, Ney, and Marmont. 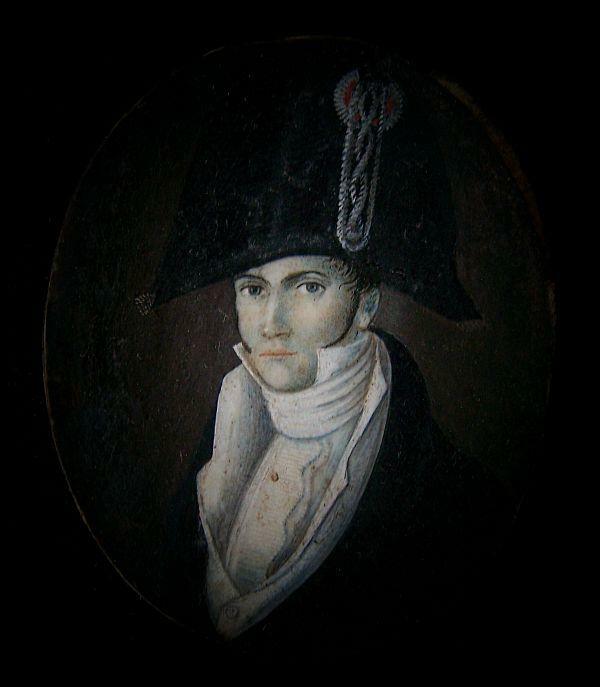 Prince MURAT, and the corps under Marshal LANNES, came up with the Russian army yesterday at Holebrunn. Our cavalry charged them: but the enemy immediately abandoned the ground, leaving a hundred carriages, with their equipage. The enemy having been reinforced, and his dispositions made, an Austrian flag of truce advanced, and demanded permission for the Russian troops to seperate from the Austrians, which was granted. 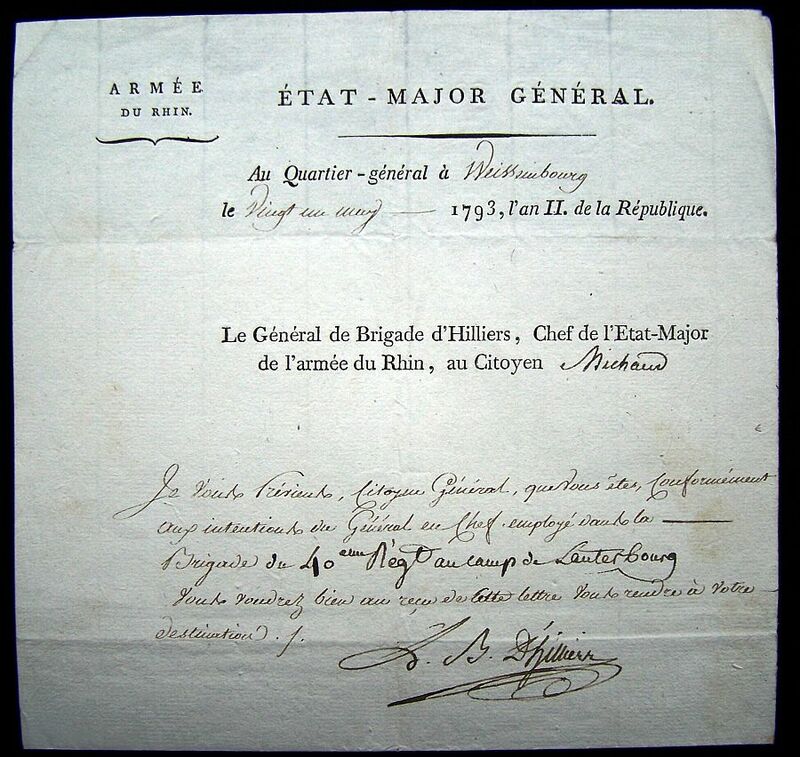 Soon after, M. Le Baron DE WINTZINGERODE, Aide-de Camp General to his MAJESTY the EMPEROR of RUSSIA, presented himself to the advanced posts, and demanded leave to capitulate for the Russian army. Prince MURAT thought it his duty to assent to this measure; but the EMPEROR disapproved of it, and immediately set out to the advanced posts. The EMPEROR’s approbation was refused, because this capitulation was a species of treaty, and because M. de WINTZINGERODE was not furnished with full powers on the part of the EMPEROR of RUSSIA. However, his MAJESTY, when ordering his army to march, declared, that if the Emperor ALEXANDER, being in the neighbourhood, would ratify the Convention, he was ready, on his part, to do the same. General VIALANNES, commanding the cavalry of Marshal DAVOUST, has entered Presburg. 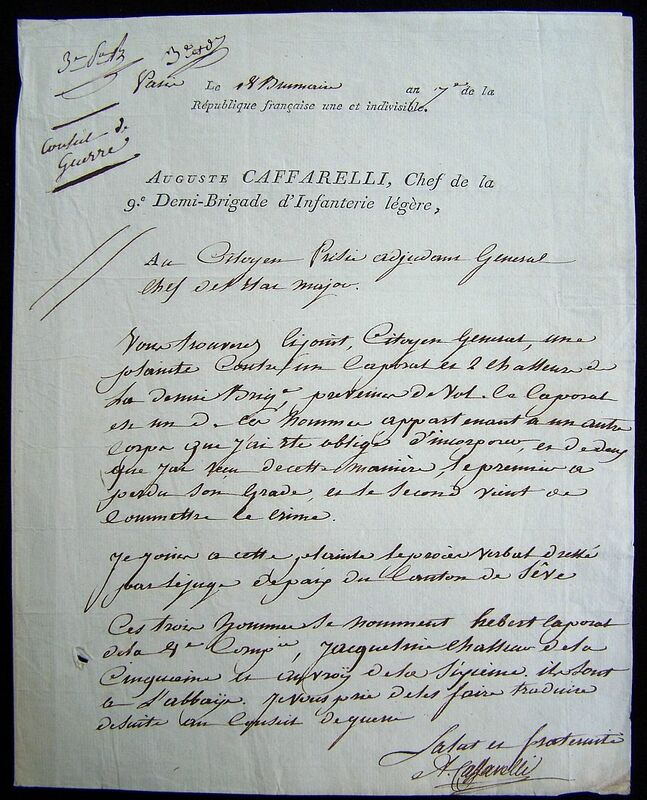 General Count PALFY addressed a letter to him, which, with its answer, are subjoined. A corps of three thousand Austrians, being intrenched near Waldermunchen, General D’HILLIERS marched against them, at the head of three battalions, when they abandoned their post with precipitation. General D’HILLIERS was at Treinitz, in Bohemia, on the 9th instant. Marshal NEY had orders to seize upon the Tyrol, and has acquitted himself with his usual address and intrepidity. He turned the fortresses of Scharnitz and Neustark, and carried them by force of arms. On this occasion, he made eighteen hundred prisoners, a standard, and sixteen pieces of cannon. On the 16th of November, at five in the afternoon, he made his entry into Inspruck, where he found an arsenal, with a respectable artillery, sixteen thousand musquets, and an immense quantity of powder. The same day he entered Hall, where he also found very considerable magazines; the inventory of them is not yet arrived. The Archduke JOHN, who commanded in the Tyrol, escaped by way of Luchethal. He had ordered a Colonel to remit all the magazines to the French, and recommended to their generosity twelve hundred sick at Inspruck. But to these glorious trophies, may be added a scene, which affected the feelings of every soldier. In the late war, the 76th regiment of the line lost two standards in the Grison; which circumstance was, for a long time, the subject of deep affliction to the whole corps. These brave fellows, conscious that Europe had not forgotten their disgrace, though their courage was uncensurable, were so fortunate as to find the subjects of their lost honour in the arsenal at Inspruck. Happily they were recognised by an Officer. All the soldiers crowded around him; and Marshal NEY, being informed of the particulars, ordered the colours to be restored to the 76th with great ceremony. Tears fell from the eyes of all the veterans; and the conscripts felt themselves elated, in the assistance they had given in the recovery of the honours snatched from their comrades by the chances of war. The EMPEROR has ordered, that the remembrance of this affecting scene should be consecrated by a tablet. The French soldier maintains a sentiment for his colours, bordering upon tenderness: they are the object of his affections, equally with a present from his mistress. General KLEIN, with his division of dragoons, has made an incursion into Bohemia. He has everywhere witnessed the horror in which the Russians are viewed by the people. The devastation committed by them make one tremble. The irruption of these barbarians, called in by the Government itself, has almost extinguished every remnant of affection for their Prince in the hearts of his subjects. ‘We and the French (say the Austrians) are the descendants of the Romans; the Russians are the posterity of the Tartars. We would rather a thousand times have the French armies against us, than such as the Russians for our Allies.’ At Vienna the mere name of a Russian excites terror. These savage hordes are not contented with pillage; they carry off, they destroy everything. A wretched peasant, whose cottage contains nothing but his clothes, in them excites no pity. The opulent man residing in his palace would hope in vain to assuage their voracity with his wealth. They would pillage him, and leave him naked under the ruins. Doubtless this will be the last time that a European Government will call in such fatal succours: were it possible they could again try the experiment, an insurrection of their own people must be the certain consequence. A hundred years hence it will not be in the power of any Prince to introduce Russians into his States. There are, notwithstanding, a great number of officers in this army, men off education, whose manners are polished, and whose ideas are enlarged; but as to what has been said of the army in general, this must always be confined to the natural instinct of the mass of which it is composed. 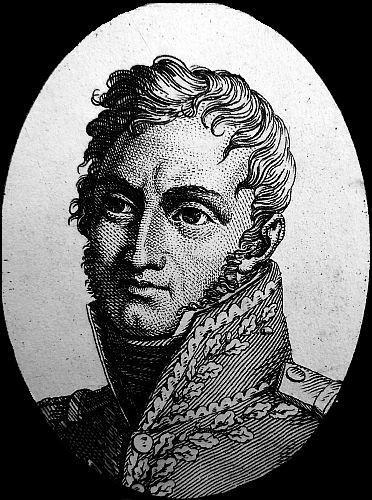 Prince MURAT having been informed that the Russian Generals, immediately after the signing of the Convention, were marching with a part of their army towards Znaim, and that from all appearances the other party were about to follow them and escape, caused it to be signified to them, that the EMPEROR had not ratified the Convention, and that he would of course attack them. 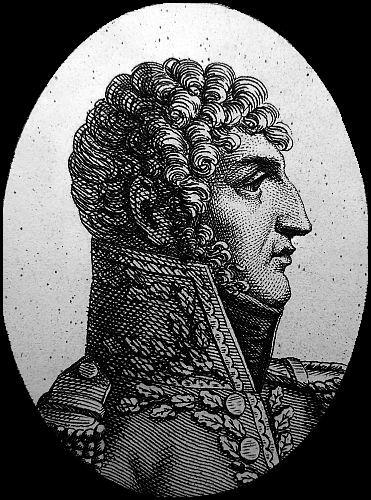 In fact, Prince MURAT, having made his dispositions, advanced towards the enemy, and attacked them on the 16th, at four o’clock, which brought on the battle of Tuntersdorff, in which a part of the Russian army, composing the rear guard, was routed, lost twelve pieces of cannon, one hundred baggage waggons, and two thousand prisoners; two thousand more remained on the field of battle. 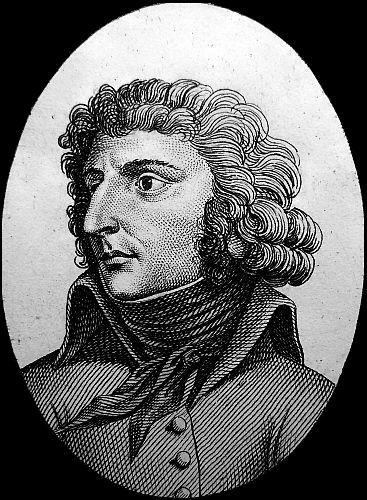 Marshal LANNES attacked the enemy in front; and, while their left was turned by General DUPASS’S brigade of grenadiers, Marshal SOULT turned their right with General LEVASSEUR’S brigade, consisting of the 3d and 18th regiments of the line belonging to LEGRAND’S division. General WALTHER charged the Russians with his brigade of dragoons, and took three hundred prisoners. 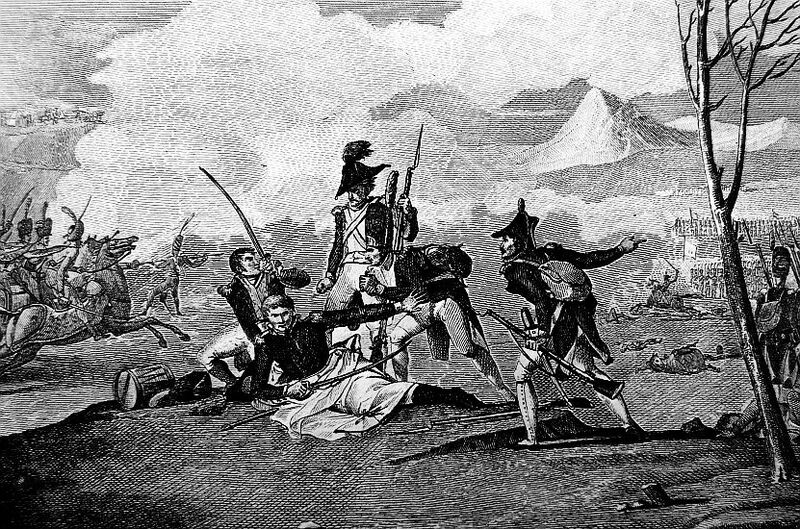 General LAPLANCHE and MORTIER’S brigade of grenadiers distinguished themselves. Were it not for the night, nothing would have escaped. There were frequent attacks with the bayonet. Some battalions of Russian grenadiers shewed great intrepidity. 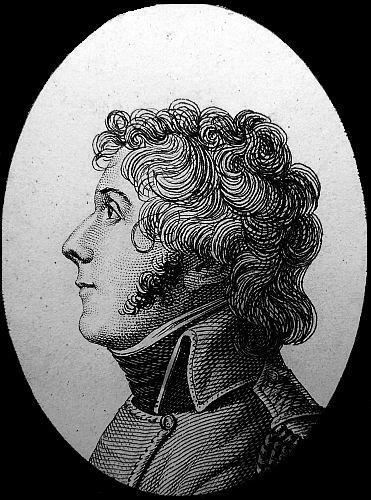 General OUDINOT was wounded. 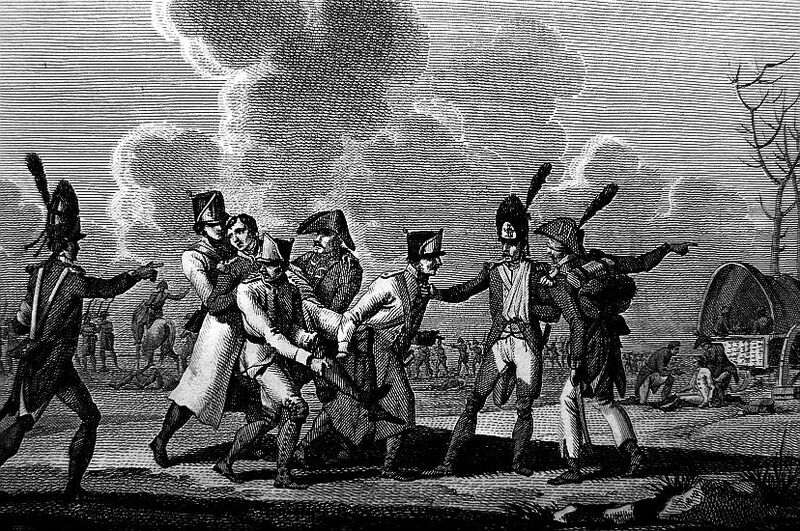 His two Aides-de-Camp, DEMANGEOT and LAMOTTE, were also wounded by his side. General OUDINOT’S wound will prevent him from serving for a fortnight. In the mean time, the EMPEROR wishing to give the grenadiers a mark of his esteem, has given the command of them to General DUROC. The EMPEROR advanced his head quarters to Znaim the 17th, at three o’clock. The rear guard of the Russians were obliged to leave their sick at Znaim, where we found a considerable quantity of flour and oats. The Russians retreated towards Brunn, and our advanced guard pursued them half way, but the EMPEROR having learnt that the EMPEROR of AUSTRIA was there, wished to give a proof of his respect for that Prince, AND HALTED THE 18th. Annexed is the capitulation of the fort of Kuffstein, taken by the Bavarians. General D’HILLIERS made an incursion into Bohemia as far as Pilsen, and obliged the enemy to quit his position. He took some magazines, and fulfilled the object of his mission. The dismounted dragoons rapidly passed over the mountains covered with ice and fir trees, which separate Bohemia from Bavaria. It is not possible to form an idea of the horror which the Russians have created in Moravia. In retreating, they set fire to the finest villages, and they murder the peasantry. In consequence, the inhabitants feel easy when they find that they remove, They exclaim, ‘Our enemies have left us.’ In speaking of them, they characterize them as barbarians who have brought ruin upon them. This does not apply to the Officers, who are in general quite different from the soldiers. Many of them are of distinguished merit; but the soldiers are guided by a savage instinct unknown in European armies. When the inhabitants of Austria, Moravia, and Bohemia, are asked if they love their EMPEROR, they answer, ‘We did love him; but how should we continue to love him? He has brought down the Russians.’ It was reported at Vienna, that the Russians had defeated the French army, and that they were marching towards Vienna. A woman cried out in the streets, ‘The French are beaten, and there are the Russians.’ The alarm was general; fear and stupefaction prevailed in Vienna. Behold the result of the pernicious councils of COBENTZEL, COLLOREDO, and LAMBERTI; therefore, these men are detested by the nation, and the EMPEROR of AUSTRIA can never recover the confidence and love of his subjects, without sacrificing them to the public hate, and one day, sooner or later, this must happen. On the 27th ult. the EMPEROR, upon receiving the communication of the full powers of M.M. STADION and DE GUILAY, offered previously an Armistice, in order to spare the effusion of blood, if any real intention were entertained of coming to an arrangement, and a definitive accommodation. But it was easy for the EMPEROR to perceive that they had other projects; and as the hope of success could only be derived from the side of the Russian army, he easily conjectured that the 2d and 3d armies, at Olmutz; and that the negotiations were only a ruse-de-guerre to lull his vigilance to sleep. 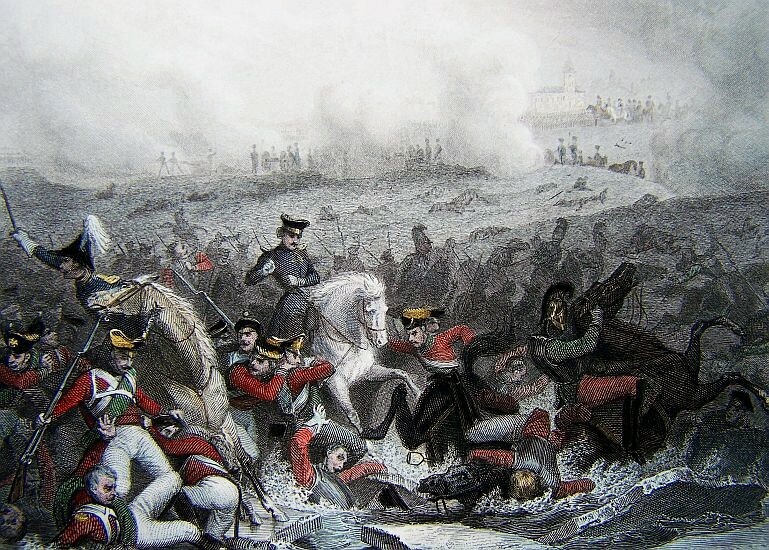 On the 28th, at nine in the morning, a cloud of Cossacks, supported by the Russian cavalry, made Prince MURAT’S advanced post fall back, surrounded Wischau, and took fifty of the 6th regiment of dragoons. In the course of the day, the EMPEROR of RUSSIA repaired to Wischau, and the whole Russian army took up a position behind that city. 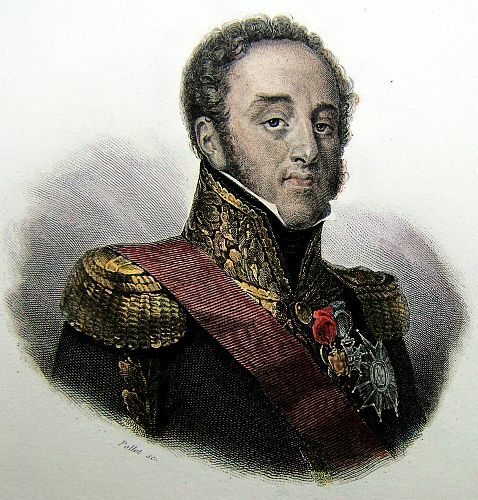 The EMPEROR sent his Aide-de-Camp, General SAVARY, to compliment the EMPEROR of RUSSIA, as soon as he knew of the arrival of that Prince in the army. General SAVARY returned at the moment the EMPEROR was reconnoitring the fires of the enemy’s out-posts at Wischau. He spoke in warm terms of commendation of the handsome reception, the favours, and the personal sentiments, of the EMPEROR of RUSSIA, and even of the GRAND DUKE CONSTANTINE, who shewed him every attention; but it was easy to understand from the conversation he had for three days with some thirty coxcombs who, under different titles, are about the EMPEROR of RUSSIA, the presumption, inconsiderateness, and imprudence, resigned in the decisions of the Military Cabinet, as much as they had reigned in those of the Political Cabinet. An army so conducted, could not but commit faults–the EMPEROR’S plan was, from that moment, to wait for them, and to watch the moment for profiting by them. He immediately ordered his army to retreat in the night, as if he had been defeated, took a good position three leagues in the rear, and laboured with much ostentation at fortifying it, and raising-batteries. 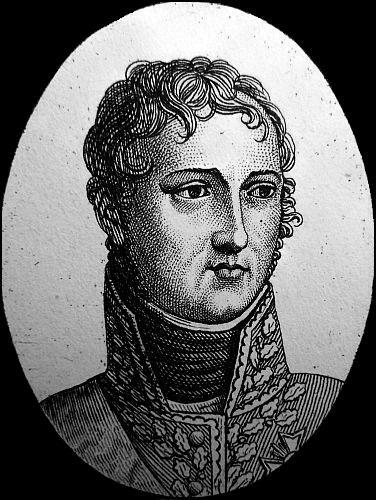 He proposed an interview to the EMPEROR of RUSSIA, who sent him his Aide-de Camp, Prince DOLGORUCKI; that Officer might remark, that every thing breathed reserve and fear in the appearance of the French army. The placing the strong guards, the fortifications made with such haste–every thing shewed to the Russian Officer an army half beaten. Contrary to the EMPEROR’S custom, whomever receives with so much circumspection the Flags of Truce at his head-quarters, he went himself to the advanced posts. After the first compliments, the Russian Officer wished to introduce political discussions. He touched upon every thing with an impertinence difficult to be conceived; he was in the most perfect ignorance of the interest of Europe, and of the situation of the Continent. In a word, he was a young trumpeter for England. He spoke to the EMPEROR as he speaks to the Russian Officers, whom he has long disgusted by haughtiness and improper conduct. 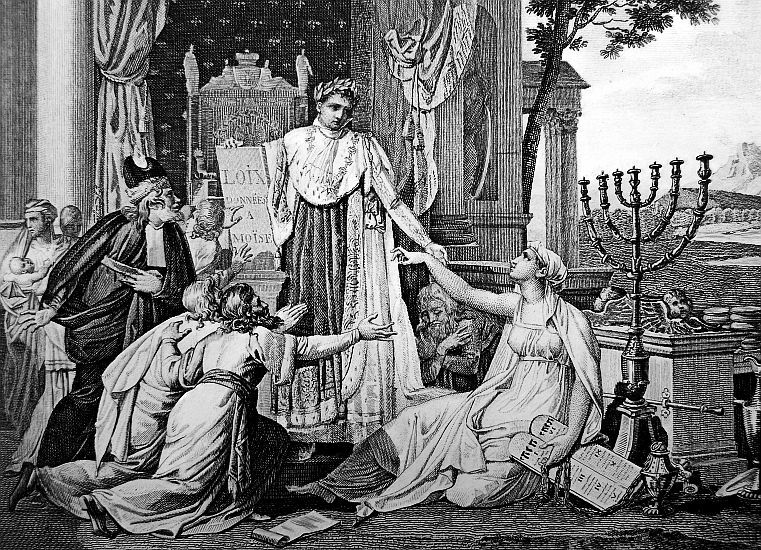 The EMPEROR repressed his indignation, and the young man, who has a real influence over the Emperor ALEXANDER, returned with a conviction that the French army was on the eve of ruin. One may be convinced above all, of what the EMPEROR must have suffered, when it is known, that towards the end of the conversation he proposed to him to cede Belgium, and to place the Iron Crown upon the head of the most implacable enemies of France. All these different steps were decided with their due effect. The young heads that direct the Russian affairs gave themselves up, without measure, to their natural presumption. It was no longer, whether the French army should be beaten, but whether it should be turned and taken–it had only done so much before, or formerly, through the cowardice of the Austrians. We are assured that several old Austrian Generals, who had made campaigns against the EMPEROR, warned the Council, that it was not with that confidence that one ought march against old soldiers and officers of the first merit. They said they had seen the EMPEROR, reduced to a handful of men, re-possess himself of victory under the most difficult circumstances, by rapid and unforeseen operations, and destroy the most numerous Armies; that here no advantage had been obtained; that, on the contrary, all the affairs with the rear-guard of the first Russian army had been in favour of the French Army: but to that, the presumptuous young men opposed the bravery of the eighty thousand Russians, the enthusiasm inspired by the presence of their EMPEROR, the pick corps of the Imperial Guard of Russia, and, what probably they dared not say, their talents, of which they were astonished the Austrians would not acknowledge the power. On the 1st of December, the EMPEROR, from the heights, saw, with indescribable joy, the Russian Army beginning, within twice the distance of cannon-shot from his advanced post, a flank movement from his advanced post, a flank movement to turn his right. He perceived then to what a pitch presumption and ignorance of the art of war had misled the Councils of that brave Army. He said, several times, ‘Before tomorrow night that army shall be in my power.’ Yet the enemy’s idea was far different; they appeared before our post within pistol-shot; they defiled by a flank march upon a line four leagues long. 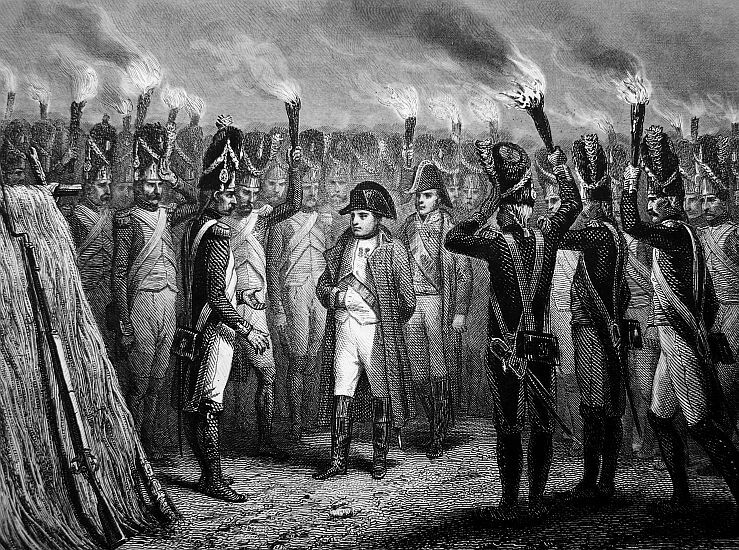 In passing the length of the French Army, which seemed not to dare to quit its position, they had but one fear, that the French Army should escape. Every thing was done to confirm the enemy in this idea. Prince MURAT sent out a small corps on the plain; but all at once it seemed astonished at the immense force of the enemy, and returned in haste. Hence every thing tended to confirm the Russian General in the miscalculated operation which he had determined upon. The EMPEROR put the annexed Proclamation in the Order of the Day. At night he wished to visit on foot and incognito all the posts; but he had not gone many steps when he was recognized. It would be impossible to depict the enthusiasm of the soldiers upon seeing him. Lighted straw was placed in an instant upon the tops of thousands of poles, and eighty thousand men appeared before the EMPEROR, saluting him with acclamations; some to celebrate the anniversary of his coronation, others saying, that the army would tomorrow offer its banquet to the EMPEROR. One of the oldest grenadiers went up to him, and said, ‘Sire, you need not expose yourself–I promise you, in the name of the grenadiers of the army, that you shall only have to fight with your eyes, and that we will bring you tomorrow the colours and artillery of the Russian army, to celebrate the anniversary of your coronation.’ The EMPEROR said, upon his return to his guard house, which consisted of a miserable straw cabin, without a roof, which the grenadiers had made for him, ‘This is the finest evening of my life; but I regret to think that I shall lose a good number of those brave fellows. I feel by the pain it gives me, that they are indeed my children, and I often reproach myself for this sentiment, for I fear it will terminate in rendering me unfit to carry on war.’ If the enemy had seen the sight, it would have terrified them–but the unthinking enemy continued their movement, and hastened with quick steps to their ruin. The EMPEROR made his dispositions for battle immediately. He sent off Marshal DAVOUST in great haste to the convent of Raygern; he was with one of his divisions, and a division of dragoons, to keep in check the enemy’s left wing, in order that, upon a given signal, it might be quite surrounded. 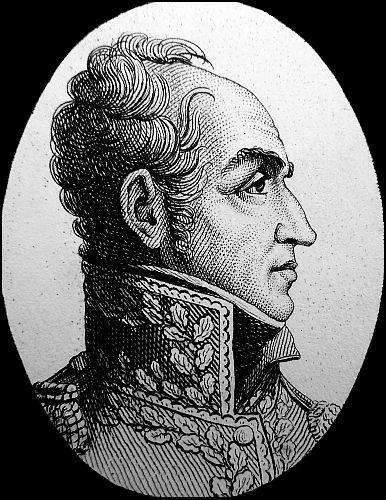 He gave Marshal LANNES, the command of the left wing; to Marshal SOULT, the command of the right; and to Marshal BERNADOTTE, the command of the center. Prince MURAT received the command of the cavalry, with which he was posted on one point. 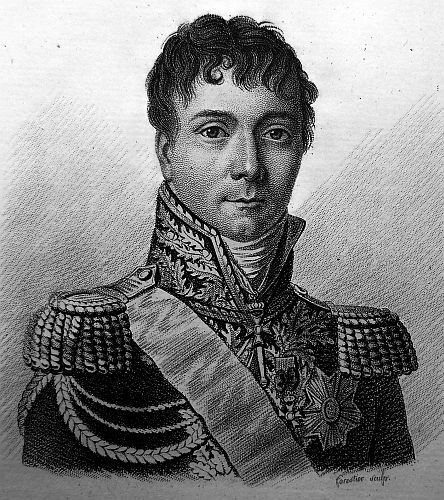 The left of Marshal LANNES approached Santon, a superb position, which had been fortified and mounted with eighteen pieces of cannon. From the preceding evening he had entrusted the keeping of that firm position to the 17th light infantry, and certainly it could not be guarded by better troops. 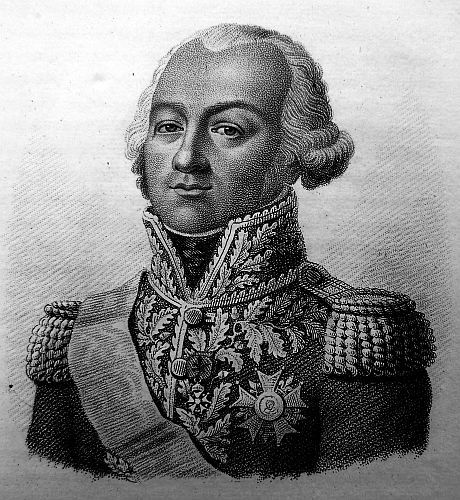 General SUCHET’S division formed the left of Marshal LANNES; the division of General CAFFARELLI formed the right, and was supported at the same time by Prince MURAT’S cavalry. The latter had before it the hussars and chasseurs under Gen. KELLERMANN, and the dragoon divisions of WALTHER and BEAUMONT, and in reserve the cuirassier division of Generals NANSOUTY and HAUPOULT, with 24 pieces of light artillery. 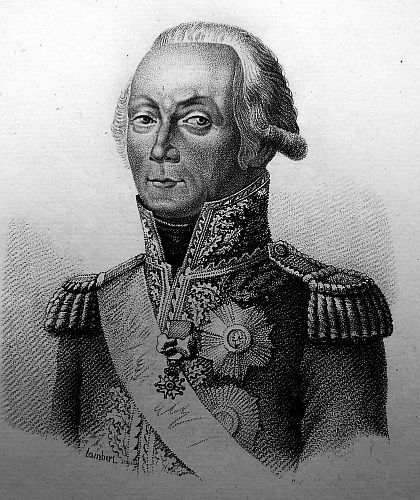 Marshal BERNADOTTE, that is to say, the center, had on the left the division of General RIVAUD, which also communicated with Prince MURAT’S right wing, and on the right the division of General DROUET. 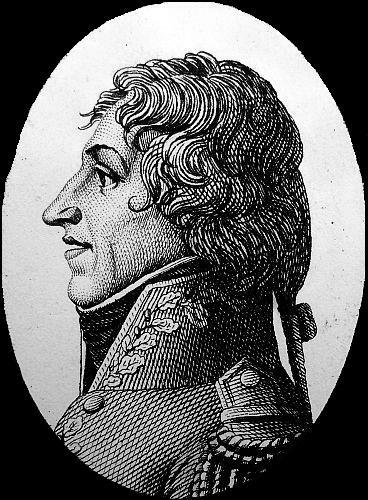 Marshal SOULT, who commanded the right wing of the army, had on his left the division of General VANDAMME; in his center the division of General ST. HILAIRE; and on his right the division of General LEGRAND. Marshal DAVOUST was detached to the right of General LEGRAND, to observe the road between the lakes and the villages of Sokolnitz and Celnitz. He had with him General FRIANT’S division of dragoons of General BOUCHIER’S division. The division of General GUDIN was directed to march at day-break from Nicolsburg, to stop the corps of the enemy, which might have outflanked the right wing. The EMPEROR, with his faithful companion in war Marshal BERTHIER, his first Aide-de-Camp Colonel JUNOT, and all his Etat Major, were in reserve, with the ten battalions of his guard, and ten battalions of General OUDINOT’S grenadiers, part of whom were commanded by General DUROC. This reserve, ranged in two miles, in columns by battalion, deployed at a distance, having in the intervals forty pieces, served by the cannoniers of the guard. It was with this reserve that the EMPEROR intended to push forward, wherever it would have been necessary; we may say this reserve was worth an army. At one in the morning the EMPEROR got on horseback to visit the posts, reconnoitre the fires of the enemy, and get an account of what the guards had learnt of the movements of the Russians–he heard that they had passed the night in drunkenness and noise, and that a corps of Russian infantry had appeared in the village of Sokolnitz, occupied by a regiment of the division under General LEGRAND, who had orders to reinforce it. Day dawned at length on the 2d–the sun rose bright; and the Anniversary of the Coronation of the EMPEROR, upon which one of the greatest feats in arms of the age was to be performed, was one of the finest days in autumn. This battle, which the soldiers persist in calling ‘the day of the Three EMPERORS,’ which others call the ‘day of the Anniversary,’ and which the EMPEROR named ‘the Battle of Austerlitz,’ will be ever memorable in the annals of the Great Nation. The EMPEROR, surrounded by all the Marshals, waited only for the horizon to clear up to issue his last orders. When the sun shot forth his first rays, the orders were issued, and each Marshal joined his corps at full gallop. The EMPEROR said, in passing along the front of several regiments–’Soldiers, we must finish this campaign by a thunder stroke, which shall confound the pride of our enemies;’ and instantly hats were placed at the point of bayonets, and cries of Vive l’Empereur were the signal for battle. A moment afterwards the cannonade began at the extremity of the right, which the enemy’s advanced guard had already outflanked; but the unexpected meeting with Marshal DAVOUST stopped the enemy short, and the battle began. 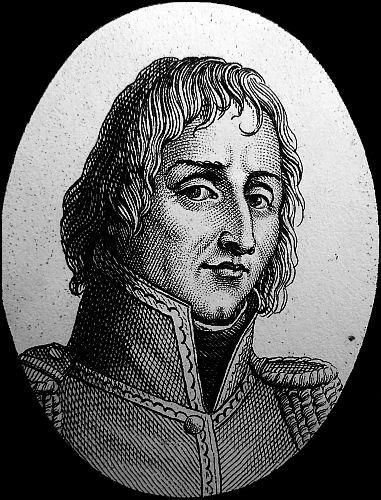 Marshal SOULT put himself in motion at the same moment, proceeded to the heights of the village of Pratzen with Generals VANDAMME and ST. HILAIRE’S division, and cut off the enemy’s right, whose movements became uncertain. Surprised by a flank march, whilst it was flying, believing itself to be attacking, and seeing itself attacked, it considered itself as half defeated. 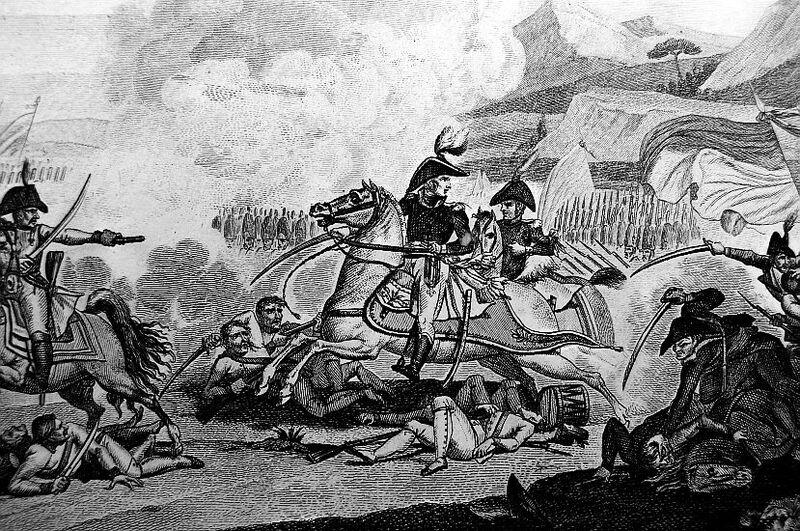 Prince MURAT was in motion with his cavalry. The left wing, under the command of Marshal LANNES, marched forward also, en echelons, by regiments, in the same manner as if they had been exercising by divisions. A tremendous cannonade took place along the whole line: two hundred pieces of cannon, and nearly two hundred thousand men, made a dreadful noise. It was a real giant combat. 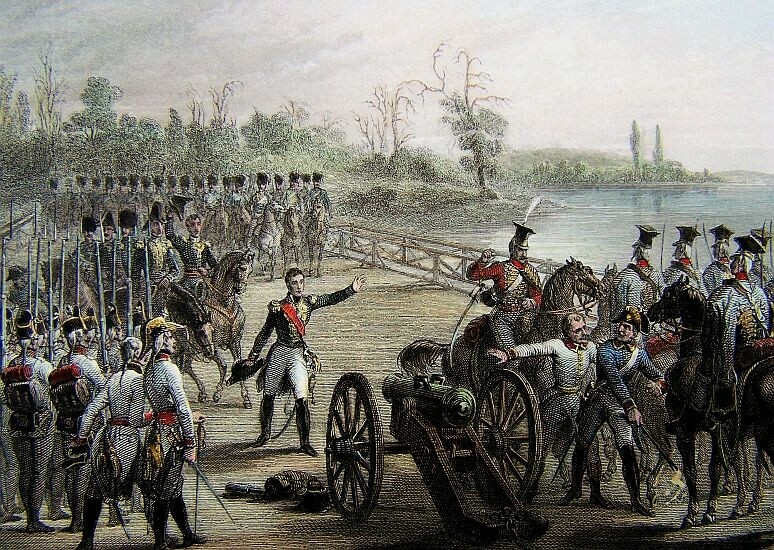 Not a hour had elapsed, and the enemy’s whole left was cut off; their right had already reached Austerlitz, the head-quarters of the two EMPERORS of AUSTRIA and RUSSIA, who immediately ordered the EMPEROR of RUSSIA’S guard to march, and endeavour to restore the communication of the center with the left. A battalion of the 4th of the line was charged by Imperial Russian Guard on horseback,and routed; but the EMPEROR was at hand; he perceived this movement; ordered Marshal BESSIERES to go to the succour of his right, with his invincibles, and the two guards were soon engaged. Success could not be doubtful; in a moment the Russian guard was routed; Colonel, artillery, standards, every thing was taken. The regiment of the Grand Duke CONSTANTINE was annihilated. He awed his safety only to the swiftness of his horse. 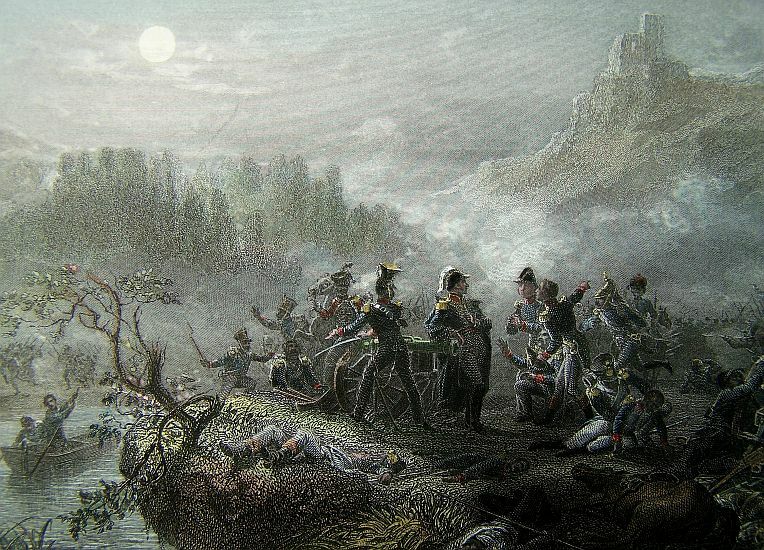 From the heights of Austerlitz the two EMPERORS beheld the defeat of all the Russian guard. At the same moment the center of the army, commanded by Marshal BERNADOTTE, advanced; three of his regiments made a very fine charge of cavalry. 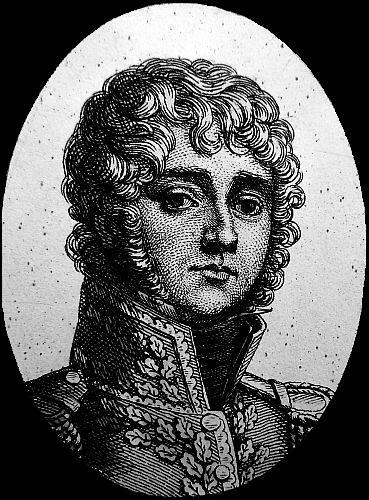 The left, commanded by Marshal LANNES, made several. All the charges were victorious. 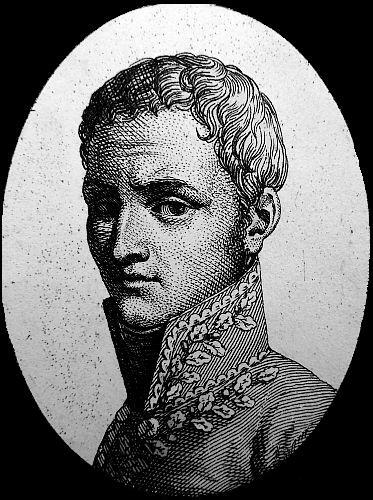 General CAFFARELLI’S division distinguished itself. The Cuirassier division took the enemy’s batteries. At one P.M. the victory was decided; it had not been doubtful for a moment; not a man of the reserve was wanted, nor had engaged; a cannonade was kept up only on our right. The enemy’s corps which had been surrounded and driven from all the heights, were on a flat, and near a lake. The EMPEROR hastened thither, with twenty pieces of cannon. This Corps was driven from position to position, and we saw the horrid sight, such as was seen at Aboukir, of twenty thousand men throwing themselves into the water, and drowning themselves in the lake. Two columns of Russians, four thousand each, laid down their arms, and surrendered themselves prisoners. All the enemy’s park of artillery is taken. 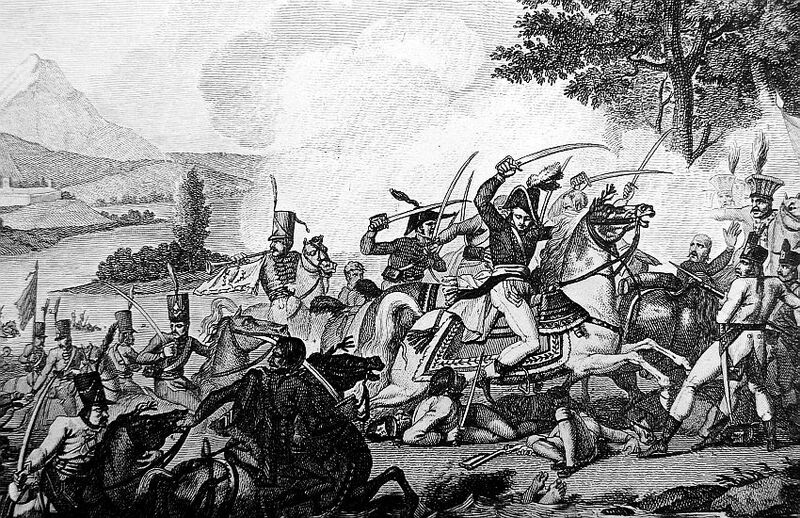 The result of this day is , forty Russian standards, amongst which are the standards of the Imperial Guard; a considerable number of prisoners, the Etat-Major does not yet know how many, but has already an account of twenty thousand; twelve or fifteen Generals; at least fifteen thousand Russians killed on the field of battle. Though we have not yet the report, we may, at the first glance, estimate our loss at eight hundred killed, and fifteen or sixteen hundred wounded. This will not surprise military men, who know, that it is only in a rout that men are lost; and no other corps but the battalion of the 4th was penetrated. Amongst the wounded are, General ST. HILAIRE, who, wounded at the beginning of the action, remained the whole day on the field of battle–he covered himself in glory; Generals of Division, KELLERMANN and WALTHER; Generals of Brigade, VALHUBERT, THIEBAULT, SEBASTIANI, COMPANS, and RAPP, the EMPEROR’S Aide-de-Camp. It was the latter who, in charging at the head of the grenadiers of the guard, took Prince REPNINE, commanding the Chevaliers of the Imperial Guards of Russia. With respect to the men who distinguished themselves, it was the whole army that covered itself with glory–it constantly charged to the cries of Vive l’Empereur; and the idea of celebrating so gloriously the anniversary of the Coronation, animated the soldier. The French army, though fine and numerous, was less numerous than the enemy’s army, which was 105,000 strong; 80,000 Russians, and 25,000 Austrians; the half of the army is destroyed; the rest has been completely routed, and the greater part threw away their arms. This day will cost tears of blood at St. Petersburgh. 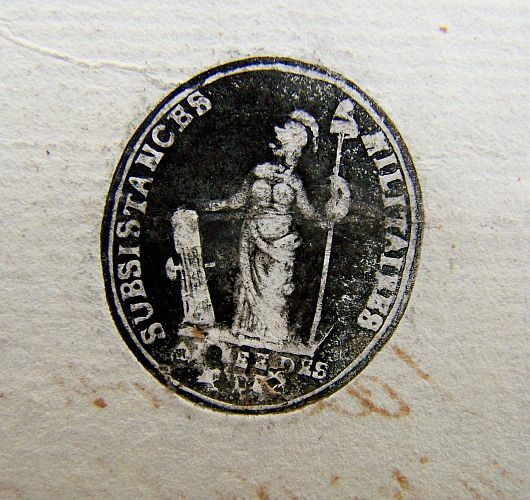 May it cause the gold of England to be rejected with indignation! and may that young PRINCE, whom so many virtues called to be the father of his subjects, tear himself from the influence of those thirty coxcombs whom England artfully pays, and whose impertinence injures his intentions, makes him lose the love of his soldiers, and hurries him into the most ill-judged operations. Nature, in endowing him with so many great qualities, had meant him to be the consoler of Europe. Perfidious Councils, by rendering him the auxiliary of England, will place him in history in the rank of men who, perpetuated the war upon the Continent, will have consolidated the British tyranny upon the seas, and produced the misery of our generation. 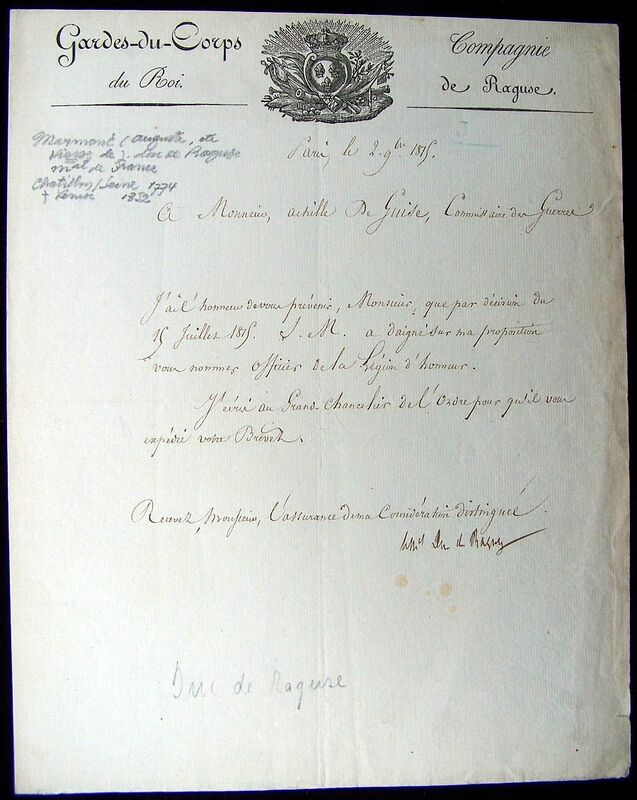 If France cannot arrive at peace but upon the conditions proposed by the Aide-de-Camp DOLGORUCKI to the EMPEROR, and which M. NOVOSILTZOFF was ordered to make, Russia should not obtain them were her army encamped upon the heights of Montmartre. 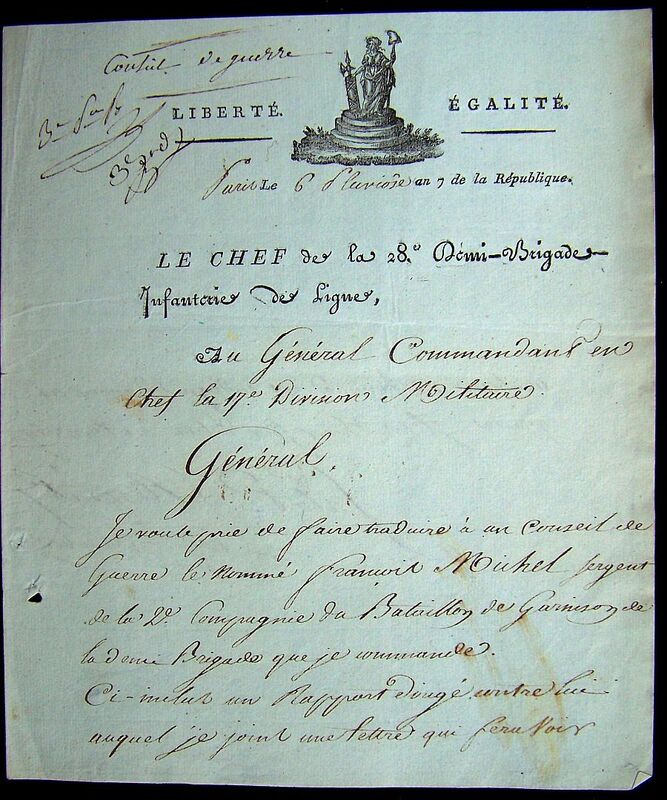 In a more detailed relation of this battle, the Etat-Major will make known what each Corps, Officers and General, have done to render the French name illustrious, and to afford proof of their love for the EMPEROR. On the 3d, at day-break, Prince JOHN of LICHTENSTEIN, commanding the Austrian Army, came to the EMPEROR’S head-quarters, in a barn–he had a long audience–yet we pursue our successes–the enemy have retired, by the road from Austerlitz to Goding. In this retreat it exposes its flank. The French army is already on its rear, and pursues it at the point of the bayonet. Never was there a more horrible field of battle. From the middle of the immense lakes we hear still the cries of thousands of men who could not be assisted. Three days must elapse before all the wounded enemy are carried to Brunn. The heart bleeds–May so much blood-shed, may so many miseries fall at length upon the perfidious Islanders who are the cause of it! May the cowardly Oligarchs of London bear the burden of so many evils! It seems that M. AUGEREAU’S corps will remain in Darmstadt much longer than was expected, as they are extending themselves, and occupy several new positions; and even keep up a communication with the garrison of Mentz, where fifteen thousand fresh troops are expected, when the whole will be put under Marshal LANNES.